Superb panoramic ocean views and spectacular sunsets are enjoyed from this sophisticated and stylish island home. 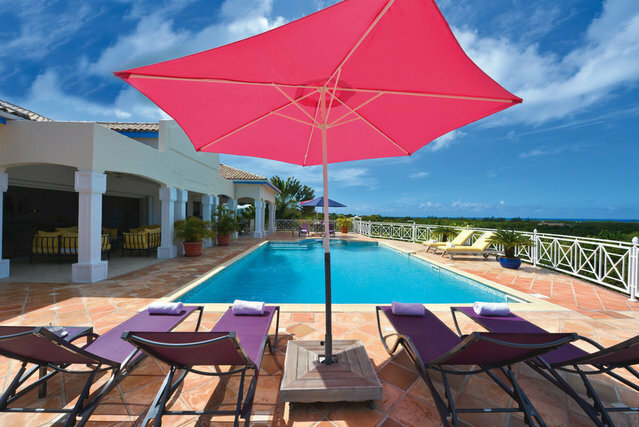 Villa Océane has an extensive terrace and a large pool with built-in table at the shallow end, perfect for relaxing and cooling off. Step from the sunny terrace and shaded porch to an elegant and spacious living area and gourmet kitchen facing the pool and the ocean. There are four ample bedrooms with large luxurious en-suite bathrooms. Lovely lush tropical gardens surround this lovely home within easy walking distance of beautiful Plum Bay beach. Pricing above is the 2 bedroom low season rate. Additional nightly rates below. Prices are per night and do not include the 8% tax and service fee.